Giving time to invest when you have a day job can prove to be a difficult thing. As the share market is highly volatile, things can change for the worse in a matter of minutes. Giving time to invest when you have a day job can prove to be a difficult thing. As the share market is highly volatile, things can change for the worse in a matter of minutes. Still, there are many investors who have built enormous wealth through trading part-time. 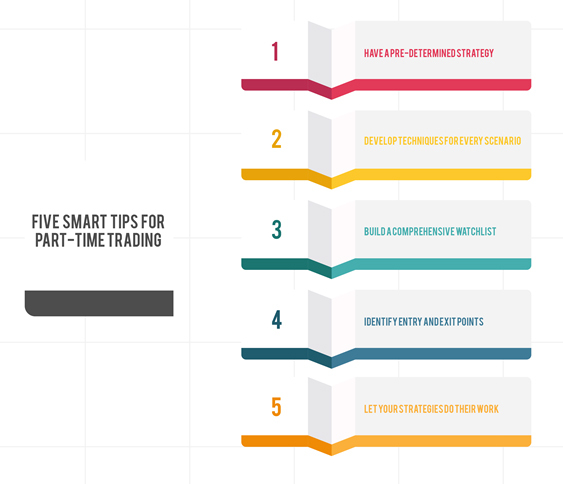 Given below are five smart tips you should consider following if you want to become a successful part-time trader. 1. Try swing trading: Swing trading includes analyzing previous price patterns and charts of a company to predict the future direction of the market. If an investor has figured out that the market is headed towards a downswing (decrease in the share prices), he/she prepares to buy new stocks, and if the market is headed towards an upswing (increase in prices), he/she prepares to sell the shares at a higher value. The best thing that makes swing trading perfect for a part-time investor is the fact that the investor doesn’t have to sit in front of the computer screen to monitor the scrip ticker all day. As swing trading allows you to predict exactly when you have to buy and sell the shares, it requires very less time to make a trade using this technique. 2. Develop techniques for every scenario: Every successful trader has a 'go-to' technique when it comes to trading in a falling market. Improvising at the very moment can lead to bad investment decisions. You should make predetermined strategies for every investment scenario you are likely to face and should test them thoroughly before using them in actual situations. Some techniques commonly used by successful traders include trend pullback, post-earnings trade, and breakout pullback. You can consult your stockbroker to know about these methods or can read about them in different financial books available in the market. 3. Build a comprehensive watchlist: Being a part-time trader, you don’t have much time to spend on the share market. Developing a watch list is the key to successful part-time trading. Identify the stocks in which you are most likely to invest in the coming days and add them to your watchlist. This will allow you to take quick investment decisions if one of the stocks in your watchlist shows profit potential, and you would save valuable time in deciding whether to invest or not. 4. Identify entry and exit points: If you do not want to spend time on monitoring your investments, you just have to identify when to enter the market and when to exit. It would mean that you determine the price at which you are willing to buy a stock and the price at which you are willing to sell it in the future. Combine your entry and exit points with a stop loss order and your chances of huge losses will be minimized by a huge margin without you having to spend time looking over your investments consistently. 5. Let your strategies do their work: You have done everything you could to make your trade successful: put a stop loss order, set a watchlist, identified your entry and exit points, as well as predetermined your ‘go-to’ strategies. Now, all you can do is just wait and see what happens to your investments. There is no point in sitting in front of the computer screen all day and watching your investments rise or dip. All it will do is make you stressful. Just relax, chill and focus on your day job and let your strategy work its magic.